Offering you a complete choice of products which include zordox tablet, deriphyllin retard, combimist l, tiova inhaler, ipravent inhaler and dericip tablet. 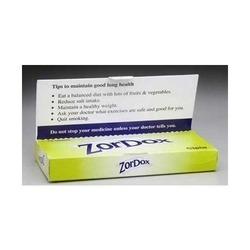 Zordox This medication is a bronchodilator, prescribed for symptoms of asthma, bronchitis and emphysema. It works in the airways by relaxing muscles and opening air passages for improved breathing. 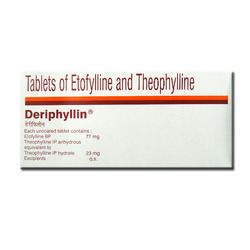 Deriplyllin(Theophylline) is used to prevent and treat wheezing, shortness of breath, and chest tightness caused by asthma and chronic obstructive pulmonary disease (a group of lung diseases that includes chronic bronchitis and emphysema). It is also used to treat temporary interruption of breathing (apnea) in newborns. 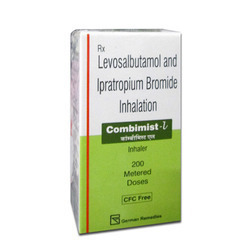 Combimist L contains Levosalbutamol and Ipratropium bromide. Combimist L is used - on a regular schedule - to prevent bronchospam caused by chronic bronchitis, emphysema, and other lung diseaes. To treat and prevent bronchospasm (constriction of airways causing breathing difficulties) in reversible obstructive airway disease like asthma, or some cases of chronic bronchitis. 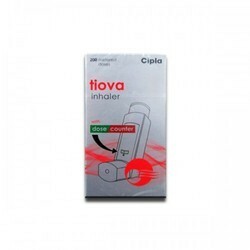 Tiova Inhelar contains Tiotropium bromide which acts mainly on M3 muscarinic receptors located in the airways to produce smooth muscle relaxation, thus producing a bronchodilatory effect. Ipratropium oral inhalation is used to prevent wheezing, difficulty breathing, chest tightness, and coughing in people with chronic obstructive pulmonary disease (COPD; a group of diseases that affect the lungs and airways) such as chronic bronchitis (swelling of the air passages that lead to the lungs) and emphysema (damage to the air sacs in the lungs). Ipratropium is in a class of medications called bronchodilators. It works by relaxing and opening the air passages to the lungs to make breathing easier. Ipratropium comes as a solution (liquid) to inhale by mouth using a nebulizer (machine that turns medication into a mist that can be inhaled) and as an aerosol to inhale by mouth using an inhaler. The nebulizer solution is usually used three or four times a day, once every 6 to 8 hours. The aerosol is usually used four times a day. Follow the directions on your prescription label carefully, and ask your doctor or pharmacist to explain any part you do not understand. Use ipratropium exactly as directed. Do not use more or less of it or use it more often than prescribed by your doctor. 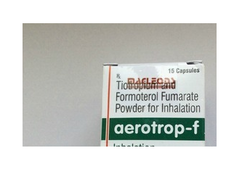 Dericip(Theophylline) is used to prevent and treat wheezing, shortness of breath, and chest tightness caused by asthma, chronic bronchitis, emphysema, and other lung diseases. It relaxes and opens air passages in the lungs, making it easier to breathe. evolin inhaler 50mcg is used to treat and prevent bronchospasm (contraction or the airways) in adults, adolescents, and children over four years of age, with reversible obstructive airway disease like asthma, chronic bronchitis, and emphysema. The Levolin Inhaler helps prevent and manage bronchospasms, as well as preventing asthma attacks. It works by reducing inflammation and irritation inside the patient's lungs, which leads to a decreased risk of chronic obstructive pulmonary diseases (COPD). It is important to note that this medication, while effective in preventing asthma attacks, is not effective at treating acute asthma attacks. Budenase Aq is a glucocorticoid steroid for the treatment of asthma, non-infectious rhinitis (including hay fever and other allergies), and for treatment and prevention of nasal polyposis. Additionally, it is used for Crohn's disease (inflammatory bowel disease). Seroflo Inhaler is a glucocorticoid steroid for the treatment of asthma, non-infectious rhinitis (including hay fever and other allergies), and for treatment and prevention of nasal polyposis. Additionally, it is used for Crohn's disease (inflammatory bowel disease). 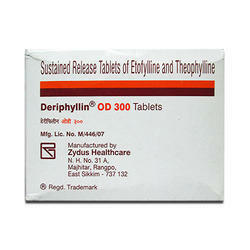 Deriphyllin(Theophylline) is used to prevent and treat wheezing, shortness of breath, and chest tightness caused by asthma, chronic bronchitis, emphysema, and other lung diseases. It relaxes and opens air passages in the lungs, making it easier to breathe. Budez CR Controlled Release Capsules are used to treat mild to moderate Crohn's disease (inflammatory disease of the bowel) affecting the end of the small intestine (ileum) and/or the start of the large intestine (ascending colon). Budez CR capsules are also used for maintenance of clinical remission of mild to moderate Crohn’s disease involving the ileum and/or the ascending colon for up to 3 months. 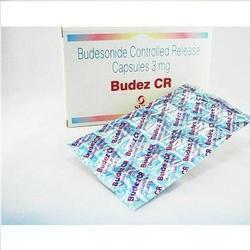 Budez CR capsules are available in strengths of 3 mg. It is also used for prevention and treatment of various allergies of the nose, throat or the lungs. 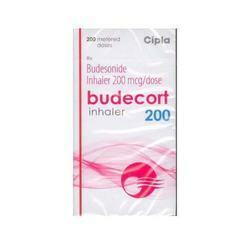 Budecort Inhaler is a glucocortic oid steroid for the treatment of asthma, non-infectious rhinitis (including hay fever and other allergies), and for treatment and prevention of nasal polyposis. Additionally, it is used for Crohn's disease (inflammatory bowel disease). 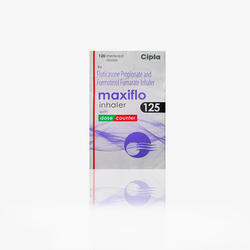 This medication is a corticosteroid, prescribed for inflammatory bowel disease, asthma, and also for breathing trouble. It decreases the irritation and swelling of the lung. Budesonide helps to relieve diarrhoea, stomach cramps and pain commonly experienced by people with Crohns Disease. Take Budesonide exactly as directed by your doctor. Do not take more or less than instructed by your doctor. Follow your doctors instructions carefully. You may need to take Budesonide for some time before the full benefits can be felt. Continue to take Budesonide even when you feel better. Adult: PO- Acute bronchospasm; Reversible airways obstruction- 80 mcg twice daily. 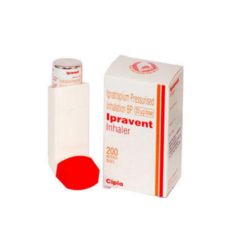 Inhalation- Acute bronchospasm; Reversible airways obstruction- as inhalation cap: 12 mcg twice daily, up to 24 mcg twice daily in severe cases. We have in our store an effective range of Ventolin. The offered medicine contains micrograms of Salbutamol. 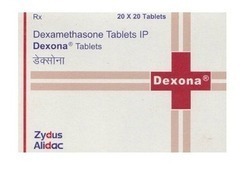 It is used for the treatment or prevention of bronchospasm. 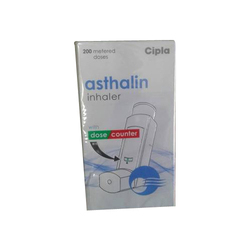 This medicine provides short acting bronchodilation in reversible airways obstruction due to asthma and chronic obstructive pulmonary disease. It decreases the body is natural defensive response and reduces symptoms such as inflammation and other allergic type reactions. It is used to treat many different inflammatory conditions such as arthritis, hormone disorders, allergic reactions, skin and eye conditions, ulcerative colitis and even asthma. Some people may also use the medication to prevent nausea and vomiting associated with chemotherapy for cancer. 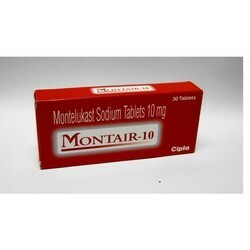 MONTAIR is used to prevent asthma symptoms, including those that occur during the day and at night-time. It also prevents the narrowing of airways triggered by exercise. If you have seasonal allergic rhinitis (hay fever), MONTAIR also treats your allergic rhinitis symptoms. It can be used in children 2 years of age and older, teenagers and adults. 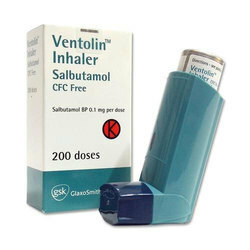 MONTAIR are not used to treat an acute attack of asthma. If an acute attack occurs, follow your doctor's instructions for your reliever medicine, and keep taking your MONTAIR each night or as prescribed. 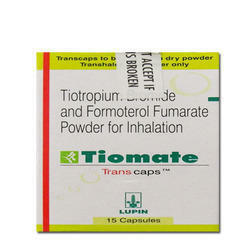 It is used in the treatment of asthma and chronic obstructive pulmonary disorder. It works by relaxing the muscles in the walls of the airways. It opens the airways and makes breathing easier. Nausea, Insomnia, Vomiting, Dizziness, Dry mouth, Diarrhoea, Nasopharyngitis. 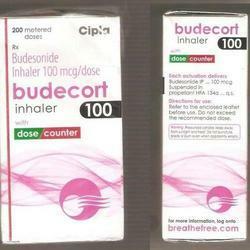 Medication is a long-acting bronchodilator, prescribed for asthma and Chronic Obstructive Pulmonary Disorder. It widens air passage and helps in easy breathing. Dry mouth, constipation, fast heartbeat, blurred vision, glaucoma painful urination and urinary retention. It is a long-acting, 24 hour, anticholinergic bronchodilator used in the management of chronic obstructive pulmonary disease.